I am fundraising to help my daughter's class. 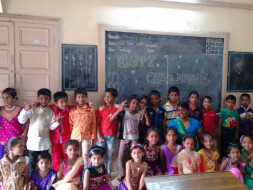 My daughter is a Teach For India Fellow. She teaches a bunch of adorable 3rd Graders in a government school in Pune. These kids come from houses with an annual income of less than 50,000-60,000. But they still come to school with the biggest smile on their faces, not letting anything bog them down. They have overcome all these odds to make more than a year's worth of growth in 8-9 months in reading, writing and Math. They have grown so much in the last year that I want to help my daughter make a greater difference. The school has barely functioning toilets, no drinking water system, no books, no sports kits for kids to play, in short, they have nothing in school apart from a teacher and a few benches. Invoices of all the purchases made will be sent to the donor, to maintain transparency. A bone to the dog is not charity. Charity is the bone shared with the dog, when you are just as hungry as the dog. Hope you can share this with the Minions on behalf of me. Make them learn how to make their own choices.